Happy Anniversary Ethiopia Program! On April 3, 2007, Children’s Hope International became licensed to work in Ethiopia for the purpose of adoption and humanitarian aid - upholding our mission to provide “Homes, health and hope for children in need." In our first year, the Ethiopia program placed 28 children into their forever homes with some truly amazing families. "God has been gracious to us as we started the program and learned the requirements for a successful adoption process in Ethiopia. I am thankful to our amazing in country staff as well as our incredible US staff who have worked diligently with me, and our families, to see that our program, and your adoption was successful," says Sharon Turner, Ethiopia Program Director. "To our pioneer families who dedicated themselves to be our first several families through, thank you for the confidence that you put in Children’s Hope to complete your adoptions. May your life with your new children be all that you have hoped for and full of God’s richest blessings. And for all of the families who have so selflessly donated to the House of Hope and other causes in Ethiopia, thank you so much." 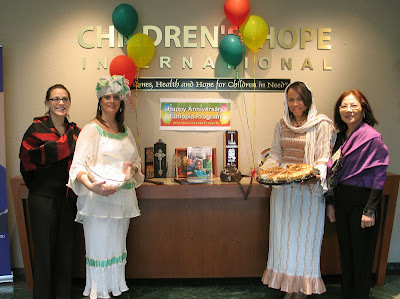 This morning in Children's Hope headquarters in St. Louis, our Ethiopia US staff celebrated their first year by providing a modified Ethiopian coffee ceremony (the traditional coffee ceremony is quite long), with popcorn and Ethiopian bread. Pictured: Erin Tilley, adoption social worker; Toni Lynch, adoption consultant; Sharon Turner, program director; Roxanne Wang, dossier review specialist. 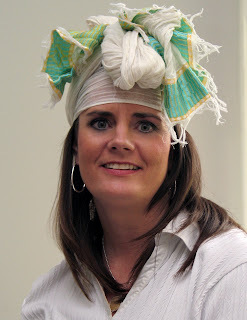 "They serve the popcorn with every coffee ceremony," says Toni Lynch, Ethiopia adoption consultant. Toni experienced Ethiopian cooking and culture firsthand last year as she traveled first with her church to Koray, Ethiopia to minister to Ethiopians suffering from leprosy and HIV/AIDS. Then, in Addis Ababaa, she prepared Children's Hope International - Ethiopia's transition home House of Hope, by painting murals and purchasing furnishings. "The popcorn is traditionally made in oil and sprinkled with both sugar and salt," she says. The Ethiopia program received another referral this week, for a sibling group of two, for one of our families and expects to receive more soon. Congratulations to the happy family! "We are looking forward to many more great years in Ethiopia. I pray that the work there and the aid that we are able to provide through our Development Aid Department continues to grow and get better and better with each passing year," says Sharon. Children’s Hope has been approved to work in northern Ethiopia, Tigrey region, in the city of Mekele. Work is now being done to hire staff, set up a small transition home and contract with orphanages in the region for the purpose of adoption. Our Development Aid Team is also establishing many projects in Mekele to help those in need in the north. "God has truly been faithful." Toni looks awesome in her head scarf! I'm a bit late - but Happy Anniversary to the Ethiopia Program! We were so honored to be among the pioneer families!